Our good friends, Mark and Cara are getting married! Off to finish packing. Hugs. Kisses. Rue Issue 5 is Live! Issue 5 of Rue Magazine is live! Click here to read it. And Happy Monday! 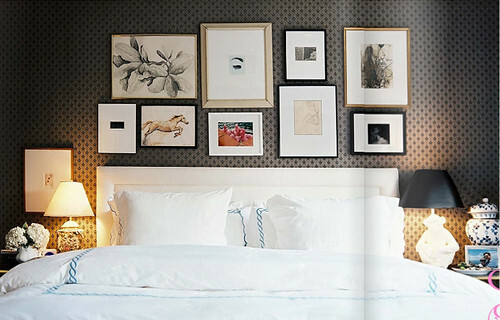 An example of mixing the striped idea with the gallery wall? All black frames, a silhouette hanging, and a round mirror. Fairly simple equation below. 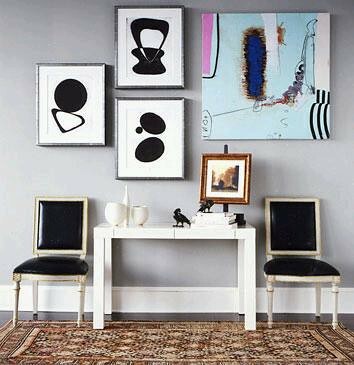 Three black and white abstracts, all in simple frames, paired with one colorful painting. Simple enough, right? All images above via mscott218's "Gallery Walls" set on flickr. I love how they incorporated a single subway art sign in this gallery wall, with black and white prints surrounding it (all in dark frames). Several of the smaller pieces look like photographs of flowers, but I think some framed sea fans could work as a great substitute. P.S. Hubs is coming come tomorrow from business trip tomorrow... Yay! 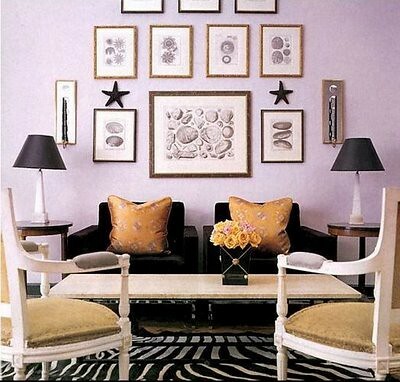 Are you drawn to the more eclectic look of frames, or the simpler frame unison above? 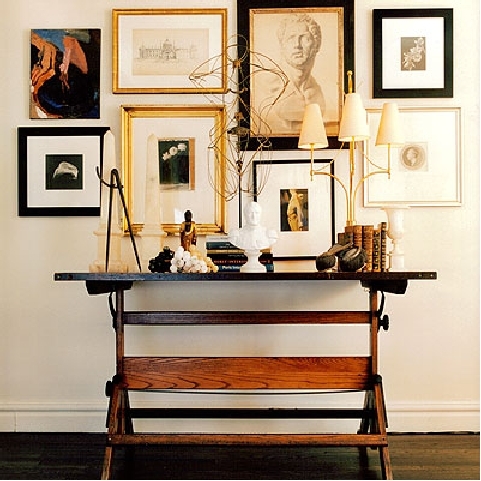 Have you found gallery art inspiration somewhere or tried it yourself? 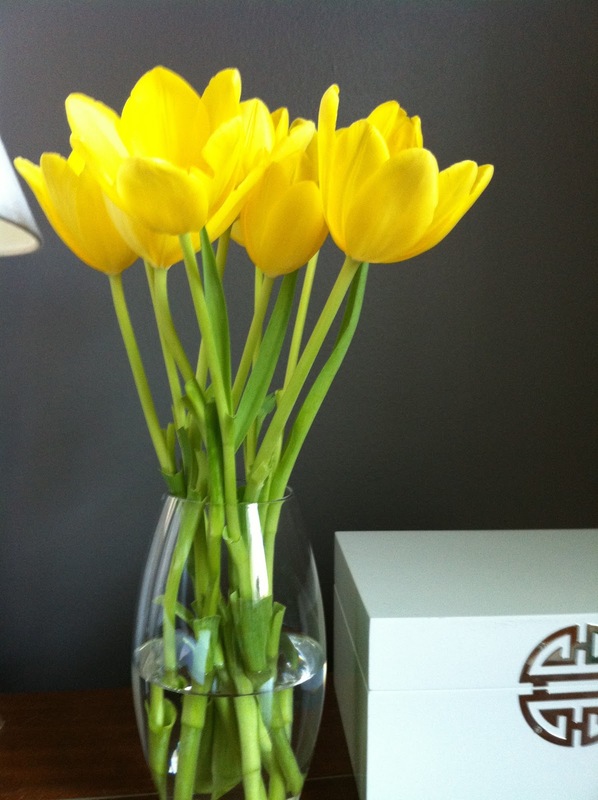 Yellow tulips this week. And a peek at the new bedroom paint color. 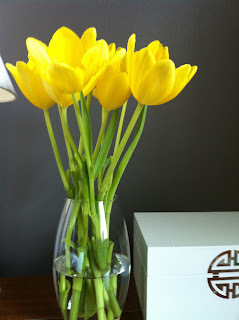 Hubs hasn't announced it, but I'm almost certain tulips are his favorite flower. He buys them more than most. 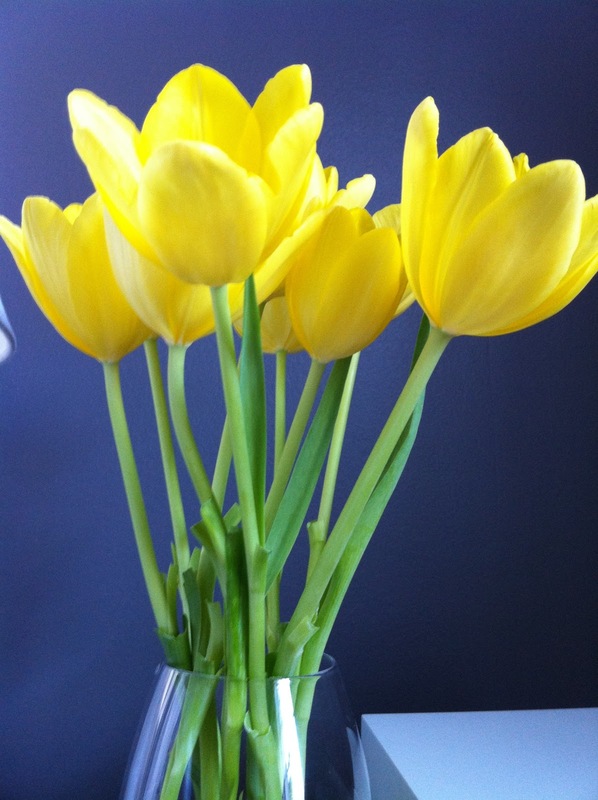 What flower makes you the happiest to bring into your home? Lonny May/June Issue is Live! 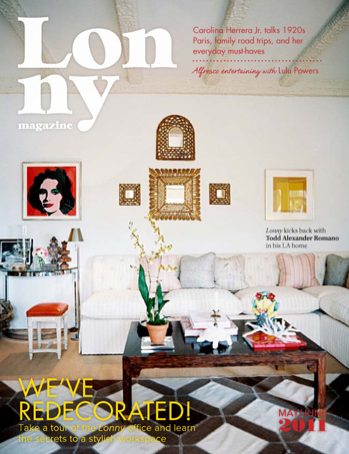 Latest issue of Lonny Mag is live! I haven't had a chance to read it yet. Let me know what you think. I've been considering a wall of art behind the television. Maybe in addition to stripes, maybe not.... Are you ever indecisive, but determined to move forward at the same time? That's where I am now. 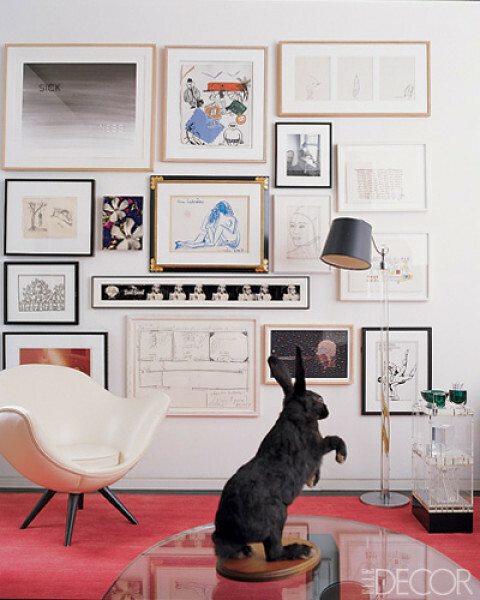 The thing about gallery walls... they typically take some planning. I've been perusing some saved photos for inspiration and found an a-ma-zing resource on flickr that may help if you're considering the idea. Here are a few highlights in Part 1 of 2: Mixing it up (Combining Various Frame Finishes). I think these are trickier than sticking with one style and frame color, but the payoff is incredible. Let's begin. Interesting mix here. 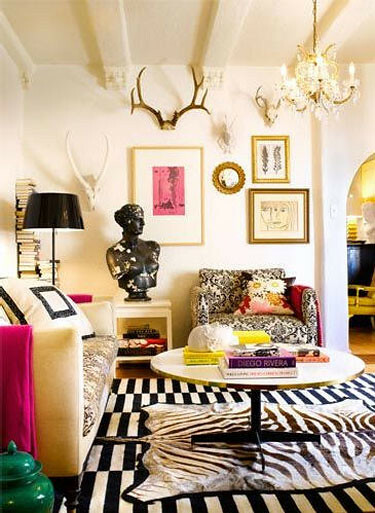 The portrait, sketch, and old photographs make it seem collected over time, but the graphic yellow print keeps it modern. 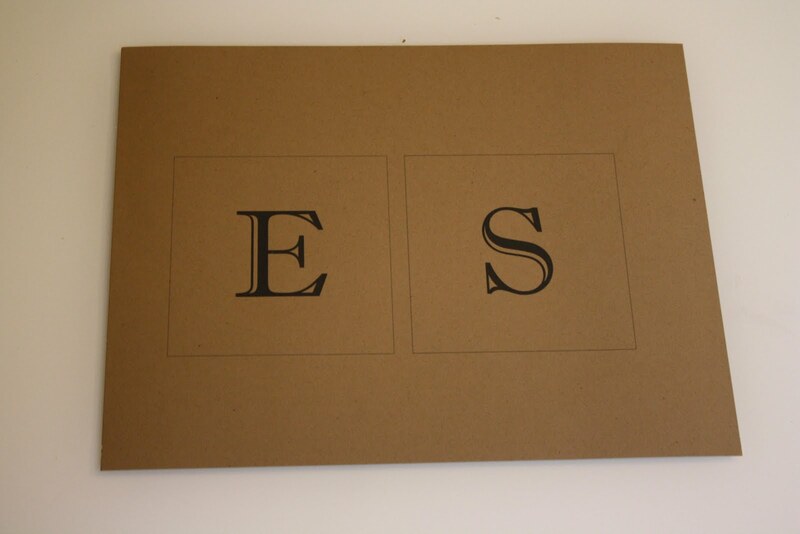 All the prints here are pretty simple, and the white matting keeps it light. 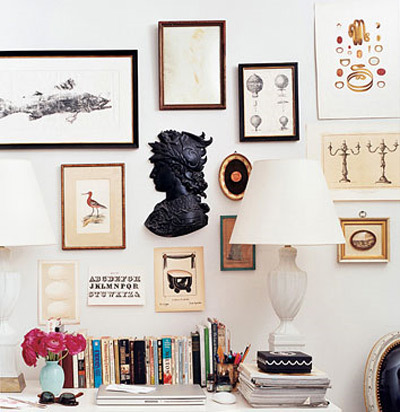 When you have a serious collection of art, this happens. Here's another example of mixing frame finishes. In this one, howevah (that isn't a typo, it's just how I'm saying it today: "howev-ah"), all the frame styles are fairly sleek. Awesomeness. 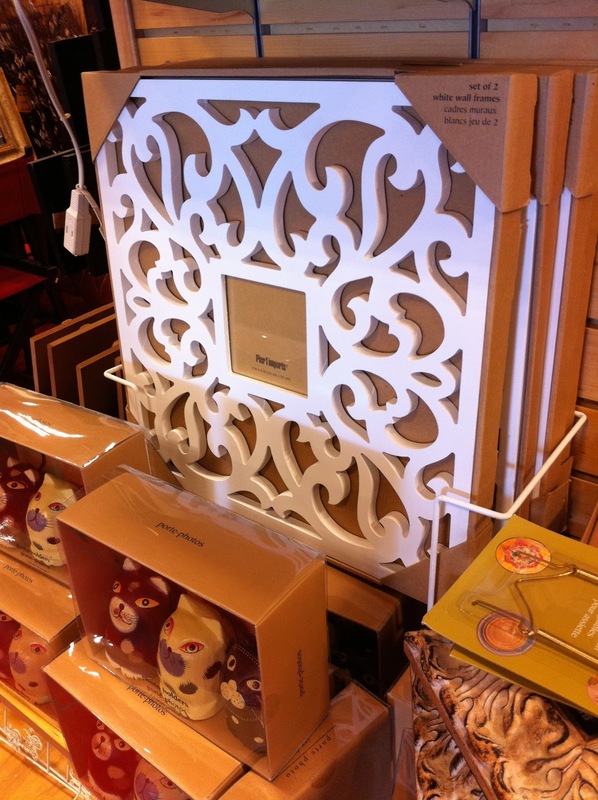 And it would not be the same without the silhouette wall hanging. *All images above via mscott218's "Gallery Walls" set on flickr. The photo below didn't come from the resource listed above. In fact, I've shown it before. 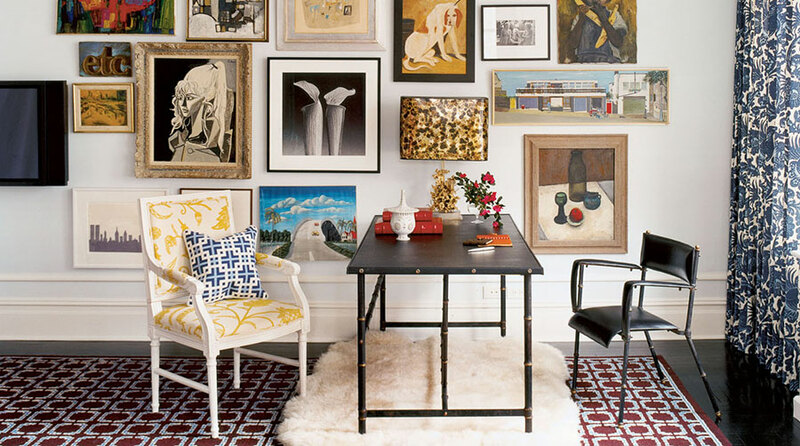 See how she included two unframed pieces (wrapped canvas paintings, I believe) amongst the framed art for an equally chic look? Anyone have experience creating gallery walls? Words of wisdom? 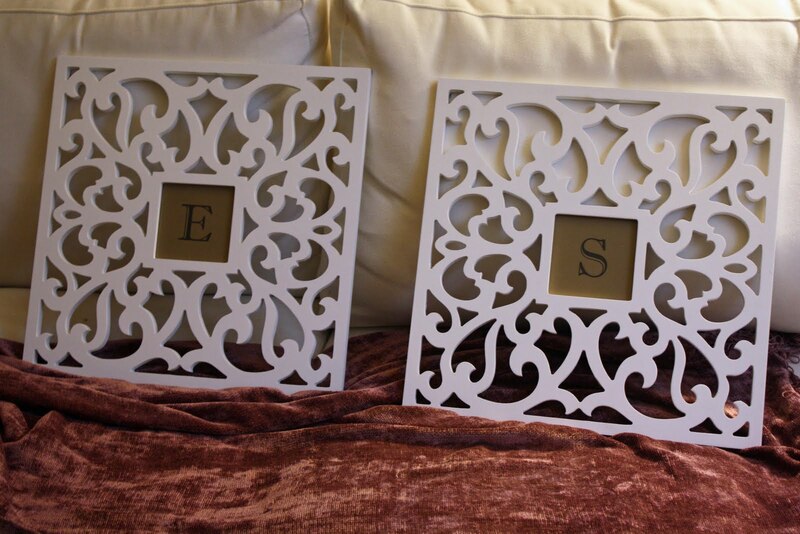 Like the eclectic look of combining finishes, or prefer a sleeker presentation with one frame color? 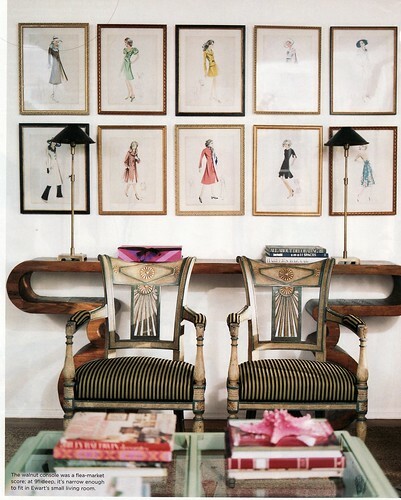 Wing Chairs - Arriving Soon! A couple of weeks ago I went to Pier One to return something. Naturally, I couldn't help but to take a gander at everything else while I was in. 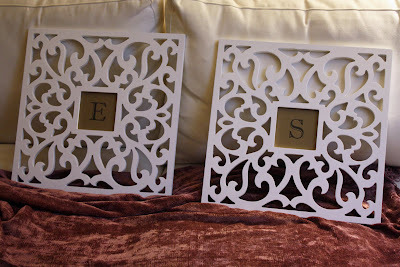 These pretty frames caught my eye. I thought they might contrast nicely against the bedroom wall behind our bed. 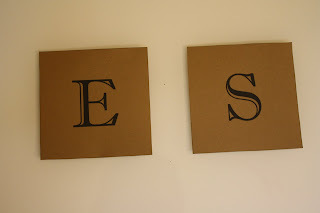 I immediately started brainstorming what to put in the 4"x4" picture frame area. I don't have to tell you that photos or art that size isn't very easy to come by. But I really liked the colors that were already there (yes, the Pier One label actually inspired me). I purchased some kraft paper and played around with some fonts. Here's what I came up with. A letter for me, a letter for my hubby. 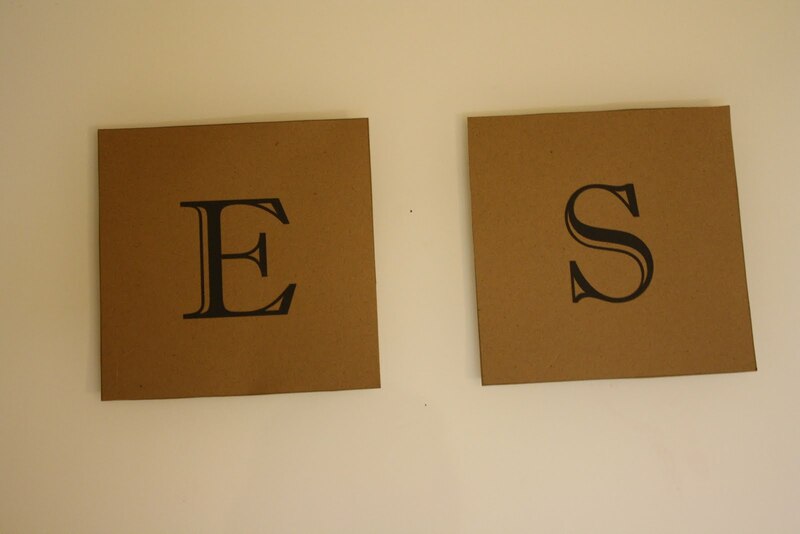 I put them in a light gray outline/box to remove the guess-work out of cutting. Less than five minutes later (dog-petting time is included in the time count). I'll photograph them in the bedroom soon. 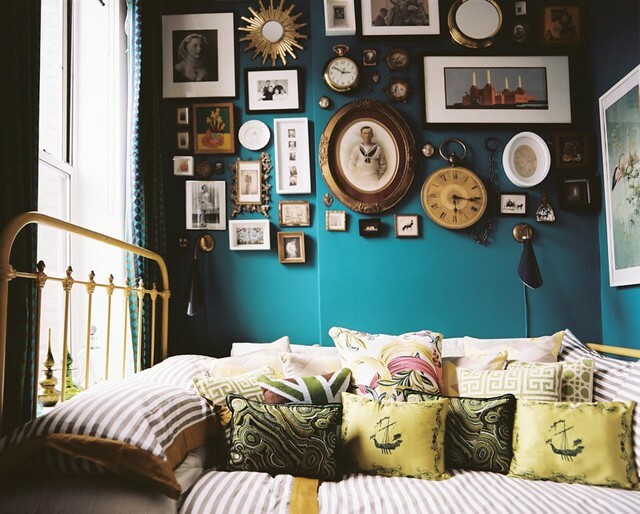 A current bedroom photograph is always on the weekend to-do list. Any other frame-filling ideas for a unique size area? DIY art experiences of your own? Oh--and leave a comment below if you'd like the name of the font I used or something. 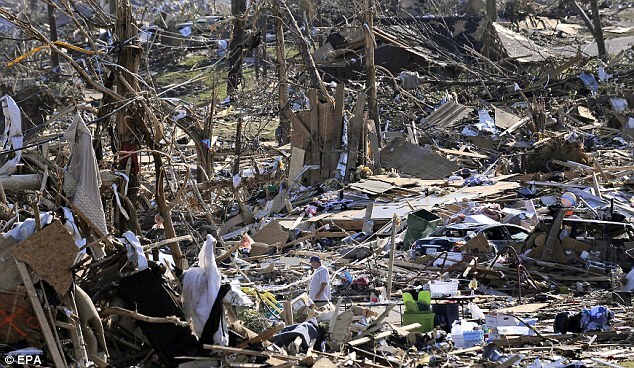 This post is a simple diary of my own experience on April 27th, lessons learned about preparing your home and family for a natural disaster, and ways to help the victims of tornadoes. My heart is breaking for the families of those who lost their lives and homes in the tornados that tore through the South last week. 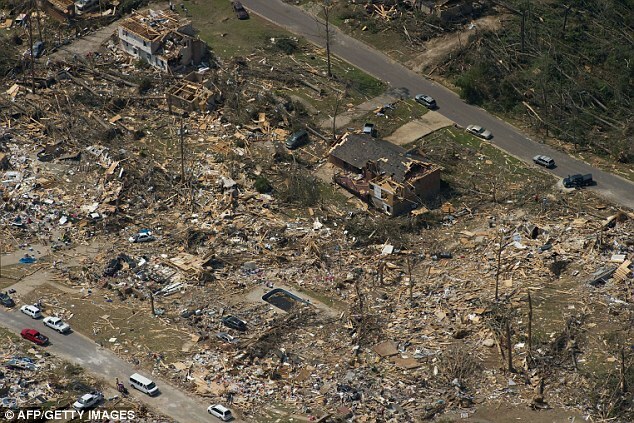 The federal government has declared this a category one natural disaster in Alabama, the highest rating possible (the same given to the damage caused by Katrina). Right now, everything else seems so trivial in comparison... What to hang on the walls, the windows, the chairs, a tweet about what someone bought at the thrift store... On the other hand, some people who are grieving for that very reason. Their homes were lost. The cozy places they worked to create. It's suddenly gone. While our own story isn't anything special, I'm writing so that some lessons I learned on that day will be captured. Hopefully a person or two may be motivated to prepare themselves as fully as possible. A lot of people in Birmingham lost power when storms came through early Wednesday morning, but our area was fine for the most part. I checked in on the weather periodically, but not quite enough to grasp the seriousness of the coming storms. Seth started driving to Mississippi for work, and realized how bad the weather was suppose to be after it was too late to turn around (about 12:00 I think). All the schools were closed by around 1:00, and a couple-or-three hours later Seth called to tell me everyone was leaving work. I have a fearless (although completely awesome in most other regards) office that tends to shrug off severe weather conditions like ice on the roads, storms, or tornadoes, so we stayed and I regularly checked a live stream of the local weather station. 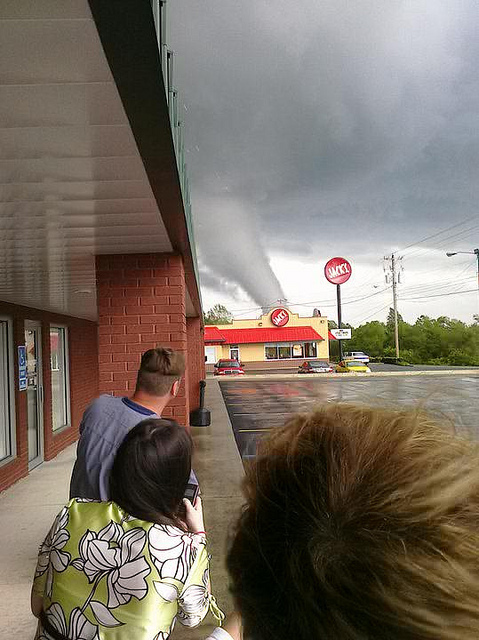 A massive tornado hit Cullman, Alabama at 2:30. Around 4:00 I checked again. A tornado was moving through Tuscaloosa. (For those of you who aren't familiar with Alabama, it's about 45 minutes away from Birmingham.) It also happens to be where the where my little brother attends school, at the University of Alabama. And of course I text messaged him and told him to go to a safe place if he wasn't there already. 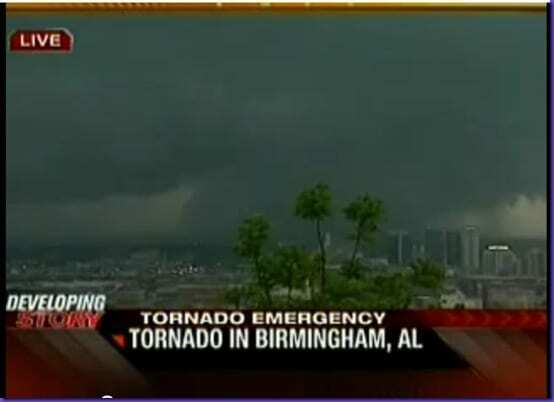 Around 5:10 I finally left work, and my friend/colleague/boss-lady called to tell me they were expecting the tornado to hit our area Birmingham at 5:30. I rushed home and walked the dogs immediately, then frantically searched for candles, batteries, and flashlights while watching the news. That's when I got scared. Really scared. I heard such urgency in the voice of James Spann as he directed people in our area to get in a safe place. Now. The same friend/colleague/boss-lady I mentioned, lives just a few blocks away and has an incredible view of the Birmingham skyline. She called again and said she could see it moving in our direction, and we should expect it in five or ten minutes. I thought about going to the super-spooky and super-dirty basement of our condo but was afraid of getting the dogs downstairs and keeping them calm with other any other dogs, so I quickly started clearing out the floor of our small bedroom closet. They showed shots of the 1-1/2 mile wide EF-4 / EF-5 tornado that was about two miles away and heading in our direction. Fast. For the first time in my life, I was scared for my life because of a tornado. I really wanted to reach out to people I loved, but was so busy creating our "safe place" that there wasn't any time. There I was, locked in the bedroom with the two dogs, praying for protection and peeping through the blinds for a sign it was here. Then, suddenly, the storm started moving in another direction. I realize now that if it had hit our place, staying in a closet would have helped very little (if at all) to keep us safe from this. My mom called just after it started moving away and was more upset than I've ever heard her. She had watched as it moved straight towards me, and knew I was alone (not counting the dogs) on the top floor of a condo building. I think she knew we probably didn't have a good chance if it did come on top of us. We were so lucky, you guys. It could have so easily been us. Our lives. Our home. Our memories. So many people weren't spared. Get low. 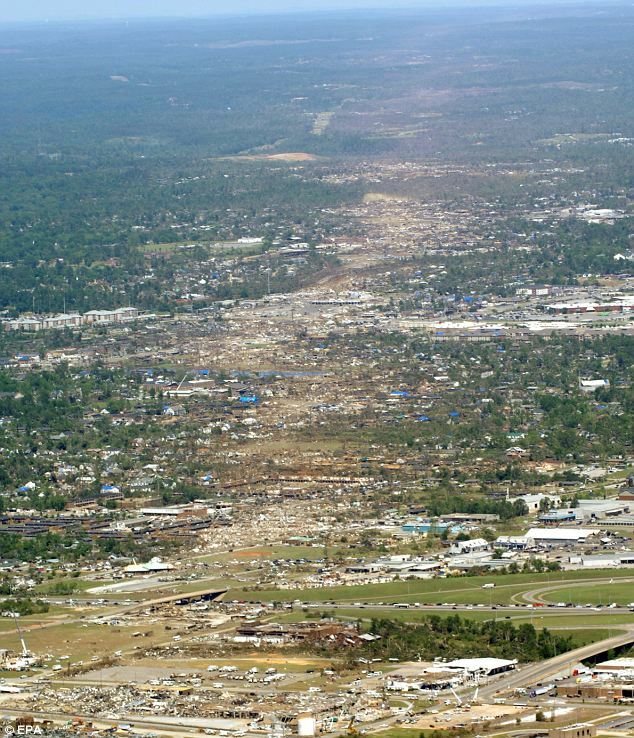 The tornado leveled homes and buildings to their foundation. If the tornado had directly hit our place, staying in a closet wouldn't have made a difference. I should have gone to the basement. Give yourself time. I waited too late to leave work and was so rushed to get ready that I could have been unprepared if it had hit us. Buy a weather radio. Our cable went out at a crucial time. Fortunately, the internet still worked and I could continue to stay tuned online. We don't have a single radio in our place so it was the only way to stay informed. Something could have happend to the connection. Assemble supplies. I'm planning to make a storm kit with flashlights, candles, batteries and other essentials so next time they'll be within reach, allowing us to focus on the status of the weather and getting in a safe place. Here's a great list of ways you can help in the relief effort. Bottom-line: pray, donate, and/or volunteer. If you know of any specific needs (listed on the site above or not) please post them below, along with any other tips for how to prepare yourself.